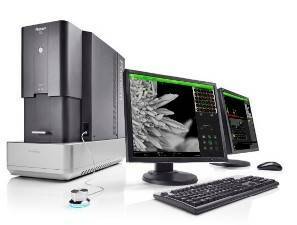 The Phenom XL desktop SEM is a user friendly, fast and affordable tool that allows full imaging of large samples up to 100mm x 100mm. While featuring several key innovations the Phenom XL it uses little energy, does not require special facilities and is still small enough to fit on a standard table. Sample structures can quickly and easily be examined and their elemental composition determined using the fully integrated EDS system. The user interface supports both existing and new users to quickly become familiar with the system and get the most of it without the need for significant set-up or training. The “single-shot” optical navigation camera allows the user to move to any spot on the sample with just a single click – within seconds. The ProSuite software includes applications such as ParticleMetric, PoroMetric, FiberMetric and 3D Roughness Reconstruction which allow the user to further analyse samples.